I used to do a lot of juicing in the past but it is very time-consuming and messy. We still juice at home but these past 2 years I find myself making more super nutritious smoothies than juices. Making smoothies is a great alternative to juicing. It is much faster, less messy, and you also get all the fiber in addition to juice. I must note that if a person has a critical health situation then juicing is the way to go. OK, so the smoothie I am bringing to you today is a tasty papaya, frozen mango, and sprouts smoothie. Now, wait just a second I saw that look on your face (those of you that just raised your eyebrows). It does not taste bad and it is very healthy for you, trust me on this. Papaya, as you may already know, comes alongside to aid digestion. This occurs because of its high content of Papain, an enzyme similar to Pepsin (which is produced by the gastric juices of the stomach). This enzyme plays a very important role in protein digestion and aids the digestive system with other difficulties that may be present. Enzymes are needed for the digestive system to work properly. They are necessary to break down food particles so they can be utilized for energy. It is important to note that improper protein breakdown in the digestive system often leads to allergies as I found out these last 9 years of health research. 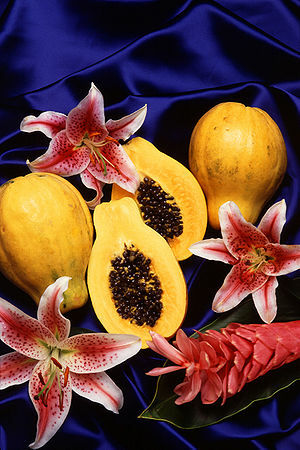 So if you suffer from allergies, you just might be lacking digestive enzymes like those found in papaya. Other symptoms you can experience if you’re lacking enzymes are bloating, belching, gas, bowel disorders, abdominal cramping, and heartburn. Sprouted grains, seeds, and legumes are another fantastic way to add living enzymes to your diet. You may not know this, but sprouts are among the most powerful enzyme-rich foods on the planet. For this recipe, you can use organic alfalfa or sunflower sprouts. The frozen mango gives it a nice flavor and removes the need to add ice which waters down the nutritional content. Once you have all your ingredients ready place them with the softest item first to enable good and even blending. So your order should look like this: liquid, optional items, sprouts, papaya, and frozen mango. Blend until nice and smooth and share with friends or a loved one. They will thank you for it. Previous Post What do carrots, cucumber and bananas have in common? Find out why you should be using natures bounty as a first resort for your skin?